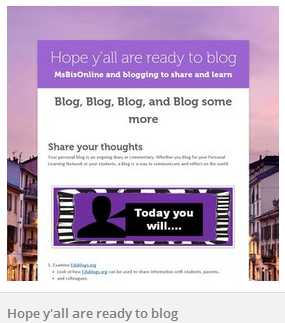 This week’s post adds a tool to your PUBLISH and SHARE tech tools toolbox. Smore.com allows you to create quality posters, newsletters and flyers for projects, presentations, and events. It is easy to create a poster: 1st sign up. 2nd choose your desired layout. 3rd Arrange the elements to your purpose. 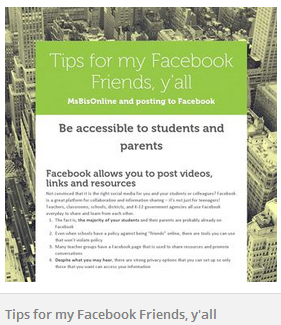 4th add necessary text, upload pictures and embed calendars or videos. With Smore.com posters you have the power to change backgrounds, designs, colors, and fonts to cater to your own needs. Publish the link for your Smore poster or embed it on your website. What can I use my Smore poster for…? Student created projects –online word walls, essays, culminating summary posters, character (object) analysis, etc. I did this Smore to highlight the DEN. 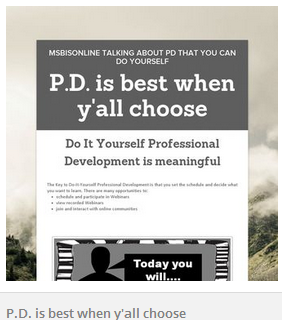 Below are screenshots of other Smore posters that I have created for my PLN. I have just started to create a collection for my classroom. They are attractive ways to organize information. Create one to advertise your upcoming grammar unit, historical period, methods of solving geometry problems, etc. Once you create your first one, you too will be addicted. There is also a new Educator’s Account that allows you to track traffic to your newsletters, remove the Smore logo, and personalize it with more background options.